In 1942, Joseph-Armand Bombardier invented the snowmobile and founded his company to manufacture them. From its humble beginnings as an entrepreneurial company in rural Quebec, led by an enterprising inventor, Bombardier Inc. has emerged as a global leader in the transportation industry. This book tells the fascinating tale of this remarkably well managed company that has enjoyed spectacular growth in its chosen markets through strong leadership and management strategy, succession planning, strategic diversification, and turnaround and acquisition artistry. 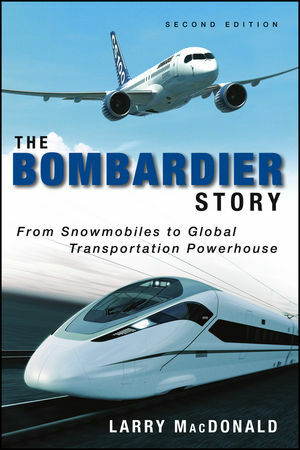 The Bombardier Story shows how invention and entrepreneurship, management and leadership, smooth succession planning, and turnaround and acquisition built this global powerhouse. Larry MacDonald is a business journalist who writes for The Globe and Mail, Canadian Business, MoneySense and other publications. He is also the author of two other books, Outperforming the Market (ECW Press, 1998) and Nortel Networks (John Wiley & Sons, 2000).